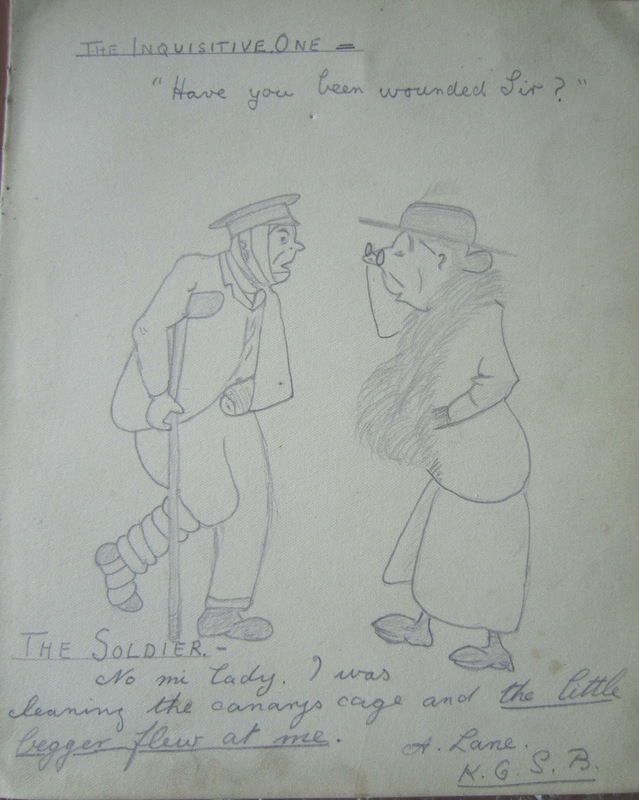 In the first five months of 2012, 23 accessions have arrived in the Archive, covering the years from WW1 right up to 2012. Accessions of new records for the collection can vary from one item, such as a photograph or annual report, through to many boxes of patient records. So far this year there have been 14 transfers of records from the NHS, and nine gifts from private individuals or organisations. These have included: a collection of negatives from the Medical Photography Department of the Princess Margaret Rose Hospital (1965-2003), NHS Lothian Clinical Effectiveness Team reports (1990s), an image of the Old Royal Infirmary of Edinburgh (RIE) taken in 1923 which had found its way to Canada, a film of Leith Hospital Flag Day (1938), nursing badges (various dates), the RIE Samaritan Society annual report (2012), oral history recordings from the Unsung Heroes project (2011-12), photographs of patients and staff taken at the Astley Ainslie Hospital in 1939, and a sketchbook containing drawings and poems from Craigleith Military Hospital (WW1). The latter has an interesting provenance and shows that archives contain lots of material far removed from its original purpose. 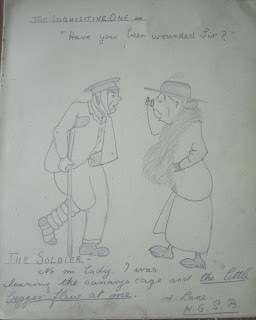 The sketchbook was given by soldiers to a nurse as a thank you present, but holds a wealth of information valuable to researchers including the thoughts of the soldiers on the War, their conditions, the political situation, and their perceptions of how members of the public thought of them. A list of accessions awaiting cataloguing is available to view on our website; it is updated every month: Accessions awaiting cataloguing. 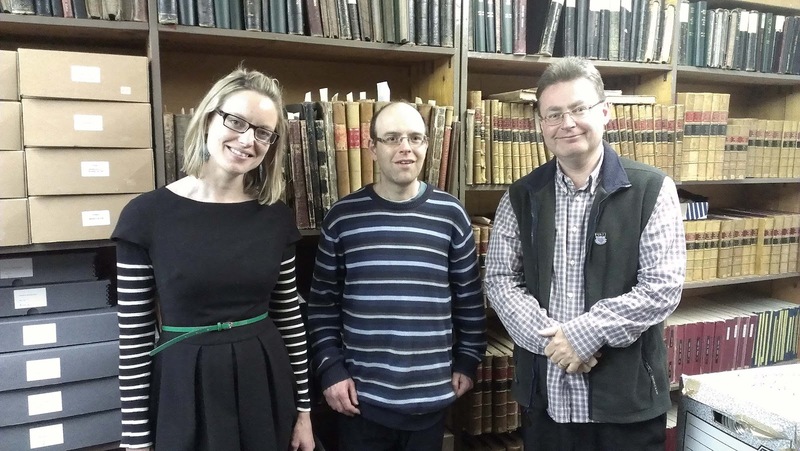 To increase our knowledge of the archive resources available in the Lothian area, of sites related to our collection, and to make links with others working in the sector, LHSA staff visited Midlothian Council Archives on 16 May. This followed on from visits to West Lothian Council Archives on 25 January and Craig House (formerly part of the Royal Edinburgh Hospital) on 19 April. A visit to East Lothian Council Archives is planned for later in the year. Ken Bogle, Local Studies Officer and Zarya Rathe, Records Officer, showed us around the Loanhead local studies search room and archive storages areas behind it. The collections include council records, parochial board records, school registers, burial records, agricultural society records and electoral rolls covering locations within the Midlothian Burgh and County Council boundaries. Ken explained that volunteer groups have produced invaluable indexes of burial records and gravestone inscriptions. We were also shown some of the fascinating special items such as the Black collection of scrapbooks of local events from the early 20th century, an Offence and Punishment book from the mid-19th century and the Dalkeith Incorporation of Hamersmiths’ volume from the 18th century. These local records are of relevance to our enquirers researching records of their ancestors who were treated in hospitals in the Lothian area, but left records of their lives in many different places. 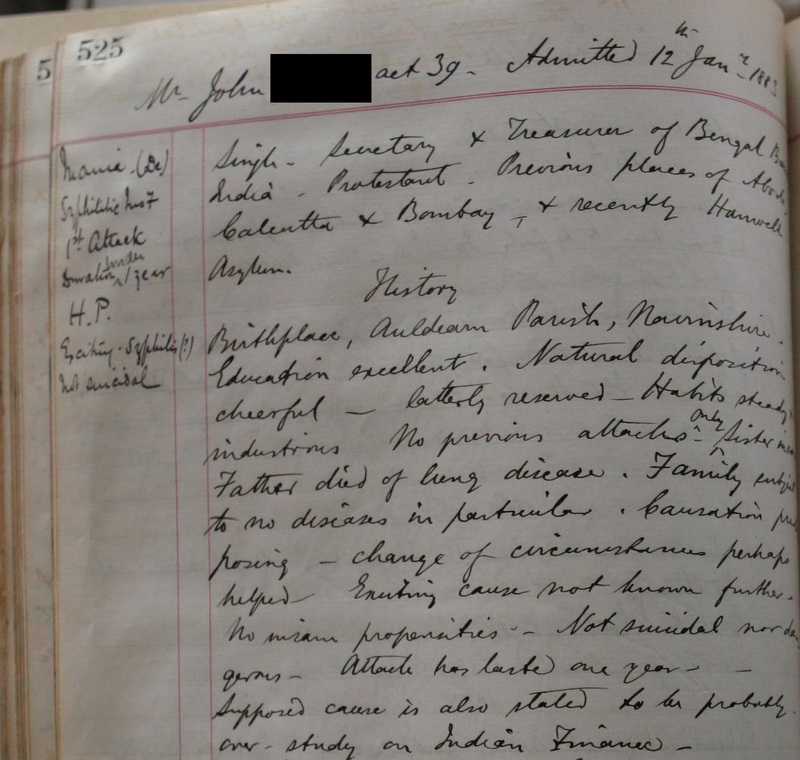 Patients from former asylums, such as Rosslynlee for which LHSA holds records, were often buried in local cemeteries, so there is considerable crossover between the records of Midlothian Council Archives and LHSA. Our two volunteers in the conservation studio have been with us since October last year. Both Fiona and Sandi have contributed blog posts before, but these were relatively early on in their placements. Now that they’ve been here for a while, have undergone extensive training and have started working on their own individual projects, this week’s blog includes their reflections on their volunteer placements to date. I have been a fortnightly volunteer here for six months and I feel quite confident in the work I am doing now. I am working to my own schedule, with Ruth always there for advice and help if I need it, and have tackled some really interesting repairs. Much of what I have been doing for the last few visits has involved tear repairs and infills, and that has led to an understanding of how to make an item more secure and stable for people to be able to handle it in the future. For instance, one piece I have just finished is a technical drawing for the construction of a medical instrument. It was very fragile along one edge especially - it felt like fine suede to touch and was fragmented into tiny shards, held together only by a few fibres. Several pieces along the edge and at the corners were missing also. With patience and care, I have filled in the gaps with Japanese paper (a fine, fibrous paper) and wheat starch paste, and used some strips of the Japanese paper on the back of the item to hold all the tiny pieces together along the edge. It now feels strong and stable when I handle it, meaning people will be able to do so for a long time to come. Today I am learning how to join together two parts of an architectural plan which have become completely detached. It involves making small strips to temporarily hold the two pieces where you want them, a bit like stitches in a wound, and I have been shown me how remove wheat starch paste when necessary too. When I looked at the pieces of the plan a fortnight ago, I was fairly sure it would be beyond me to fix it, but actually, by applying some of that special virtue which I am often short on - patience - I have been able to carry out a good repair and recreate a plan which was very hard to look at before. It is so satisfying! I love planning out my day, laying out a room full of my work in progress - some tear repair jobs with drying paste, some which are ready for rehousing, others which need further repairs or which need to be pressed. I have finished the Edinburgh Fire Plans conservation project and am amazed by the difference I have made to it. It is all very enjoyable and I really look forward to my visits! I have had the privilege to be working on some of the Carmichael Watson (CW) papers which Edinburgh University Library has in its Centre for Research Collections. These papers date from the late nineteenth and early twentieth centuries and are transcriptions of secular songs collected in the Highlands and Islands of Scotland. I practised surface cleaning and rust removal on some sheets of test paper before doing the same with the CW papers. This is a long process as there are 548 sheets to be worked on and I’ve been doing this for some months now, having worked on just over a third of the pages. Ruth showed me how to clean the paper first with a chemical sponge and then use a piece of eraser to clean even more. Some of the pages are really dirty and it’s very satisfying cleaning off the surface dirt. However, this has to be done with care as some of the pages are torn. Rust which has accumulated as a result of pages being stapled together has to be removed very carefully with the tip of a scalpel. This is where I put on magnifying glasses - essential to see the paper close up so as not to scrape the actual paper away instead of just the rust. Today I’ve learnt how to do tear repairs and infills using Japanese paper and wheat starch paste on what is termed our sacrificial pages (waste paper with tears and losses lovingly made by Ruth!). Much practise is needed before I can be let loose on pages of any worth. Again, this is a fairly tricky business but satisfying knowing that I will have helped in bettering the condition of these papers for future researchers. A recently completed task has been the re-housing of LHSA’s collection of glass plate negatives which relate to the teaching of Obstetrics at Edinburgh University from the 1950s to 1970s. These were designed to be used with a lantern box to project the images onto a wall or screen. 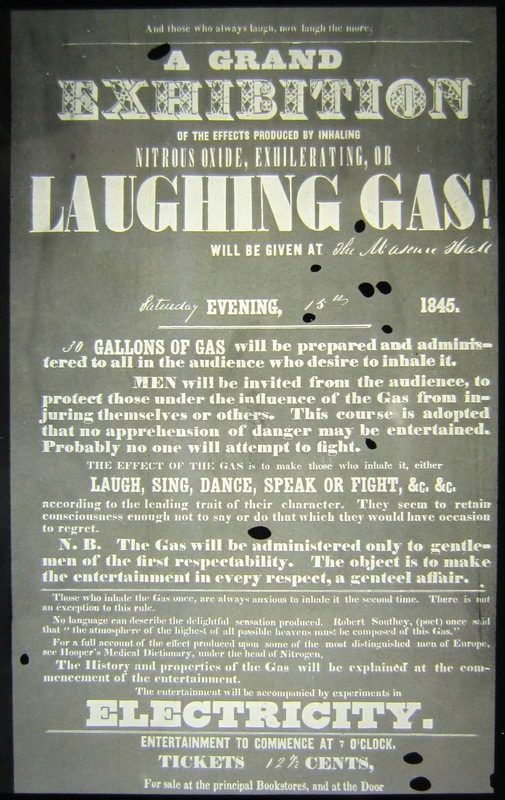 After over 40 years of being used only as a sideshow amusement, nitrous oxide was finally considered for use as an anaesthetic for minor operations from 1847 onwards. This was a great development, because during the early 19th century surgery was greatly restricted by the patients’ capacity to suffer pain. 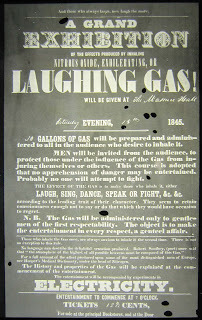 Operations were also carried out using the stronger anaesthetic, ether, from 1846. 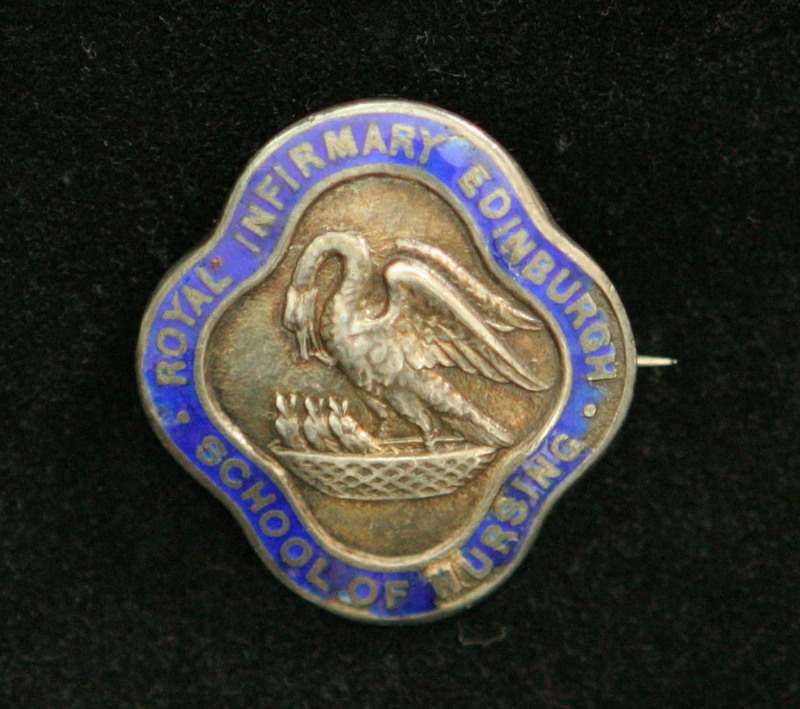 In Edinburgh, Professor of Midwifery, James Young Simpson sought an alternative to ether as it was found to be unpleasant and an irritant for patients to inhale. By means of dangerous experiments, inhaling various chemicals with his assistants, Simpson found that chloroform was stronger and more pleasant to inhale so he began using this for his operations from November 1847. Today, a wide variety of both general and local anaesthetic drugs and muscle relaxants are used to ensure patients can be operated on safely. Careful monitoring of patients’ responses means that the doses of them can be controlled and the risks minimised.